Most of Canada's 34+ Million population clusters in cities close to the US/Canada border like Vancouver, Calgary, Regina, Winnipeg, Toronto, Ottawa, Montreal, Quebec City and Halifax. 21 Million people live in Central Canada (Ontario and Quebec). 10 Million people live in the Western Provinces and the other 3 million in the Maritime Provinces. Under 100,000 people live in the northern territories. As Canadians know, Canada is a massive country, not just east-west, but also north-south. To our American friends, you need to think of a provice as you would a state. For your sake, I’m using miles below instead of kilometres. 1 mile = 1.609344 kilometers. Central Canada (sometimes the Central provinces) is a region consisting of Canada’s two largest and most populous provinces: Ontario and Quebec. Due to their high populations, Ontario and Quebec have traditionally held a significant amount of political power in Canada, leading to some amount of resentment from other regions of the country. Before Confederation, the term ‘Canada’ specifically referred to Central Canada. Today, the term “Central Canada” is less often used than the names of the individual provinces. Despite its name, Central Canada is only called central due to it being the centre of political power in Canada. It is located entirely in the eastern half of the country, with Quebec extending further east than every province, except for Newfoundland and Labrador. 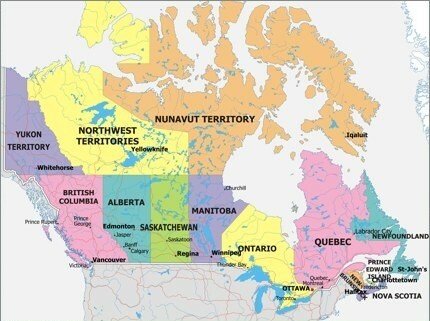 Longitudinally, the middle of Canada is a meridian passing just east of Winnipeg, Manitoba – hence the argument for using the name Central Canada to refer to the Winnipeg show — it is the city closest to the longitudinal middle of the country; however the geographic centre (latitudinal and longitudinal) of Canada is located further north and is near Arviat, Nunavut. Anyway, Ontario and Quebec are called Central Canada because the provinces on either side of it are often grouped together as distinct regions historically and politically – effectively dividing Canada into 3 distinct regions: the Western Provinces (British Columbia gets lumped in with the three Prairie Provinces of Manitoba, Saskatchewan and Alberta) to the West (natch), Ontario/Quebec aka Central Canada (as they are in between) and the Maritime (or Atlantic) Provinces to the east. A quick, cursory overview of English language comic events in Central Canada (Ontario/Quebec) — Ontario has lots of comic book events, including: the Beguiling’s Toronto Comic Arts Festival, Wizard’s Toronto Comic-Con, and then there’s Fan Expo Canada (also in Toronto), which also puts on the smaller Toronto ComiCON events. Ottawa has the Ottawa Comic & Card shows. Quebec has many french language comics festivals in Gatineau, Quebec City and Montreal. As far as english language comics events go, Montreal has the Montreal Comic Con and some smaller minicons. To give you a sense of how close Montreal and Toronto are, it would take you about 6 hours to drive from one to the other – about 340 miles. Manitoba is the next province west of Ontario. Winnipeg, MB is the home of the C4 Central Canada Comic-Con that Wizard just acquired for 2011. If I wanted to drive from Toronto to Winnipeg it would take me about 24 hours to do it, almost 1400 miles to drive. The closest competing convention to the Central Canada Comic-Con is the Minnesota FallCon in Minneapolis-St.Paul (8 hours driving, over 450 miles), which takes place in mid-October. West of Manitoba it’s Saskatchewan, which really has absolutely no comic-cons at this time. West of Saskatechewan it’s Alberta – whose biggest cities are Edmonton and Calgary. Calgary is home to the Calgary Comic & Entertainment Expo and the Red & White Calgary Comic & Toy Expo. I wouldn’t say that the Winnipeg Central Canada Comic-Con and the Calgary Comic & Entertainment Expo are in much competition any more than any other shows in different regions are. It would take you 13 hours to drive to Calgary from Winnipeg as they are over 800 miles apart. New York and Chicago are about 13 hours driving apart – almost 800 miles. It would take someone in Toronto over 35 hours of non-stop driving to go the over 2100 miles to Calgary. Generally this is why most Canadian dealers in Central Canada (Ontario/Quebec) don’t do Western conventions and vice-versa. For the rare ones that do, they generally ship their books instead of driving them. Finally, west of Alberta, over the Rocky mountains, is British Columbia, whose biggest city Vancouver has only some smaller one day shows at this time – the Vancouver Comicon. Vancouver and Calgary are almost 12 hours driving apart – a little over 600 miles. Vancouver really is the unplucked gem in the Canadian convention scene – with a burgeoning creative scene, a film and television industry that includes many genre-related programs and movies being filmed there, and a geographical proximity to Seattle, WA it’s no wonder that I keep hearing rumours of different groups and companies thinking of setting up a convention there. This entry was posted in General Announcements, Op/Ed by Kevin A. Boyd. Bookmark the permalink.